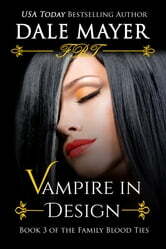 Teenage Tessa and her friends should have been home and safe after being rescued from their vampire kidnappers. Instead, she wakes to find herself alone, Jared and Cody apparently snatched all over again…and she has no clue know who took them. Scared, pissed off and aware she's been a target all along, Tessa discovers she's been locked in a lab by those who want to tap into the latent genetic abilities in her vampire blood. Caught in a dangerous maze, Cody knows he has to help his fellow captives, but all he wants to do is find Tessa. The connection growing between him and his best friend's sister has undeniably become the center of his universe. But any future they might have together is in jeopardy if they can't stop the Old World vampires from developing a blood farm they intend to fill with humans in stasis who will serve as their permanent feeding supply. The only ones standing against their evil plans to take over the world are Cody and Tessa's clan of peaceful vampires. Jared is exhilarated to be free at last…but even as the distance between him and the blood farm he miraculously escaped from increases, he can't stop thinking about those still trapped there – the ones who helped him flee. Can he really walk away from what's happening? From the horror it portends? When he discovers something sub rosa that all but paralyzes him, he has no choice but to act on the knowledge…even if it means walking straight back into the hellish prison he narrowly escaped from.